Please read this guide before attempting installation. By reading the steps outlined you will be more prepared for the installation reducing possible errors and problems. Contact us at HIDKITWAREHOUSE.com if you have any trouble. Make sure your engine bay is cool to the touch. Make certain the vehicle is in park and shut off. Be careful not to crush or cut the bulb wiring..
Do not connect the high voltage electrodes while the light switch is on. It is recommended to test each light function before final permanent installation. Lights do not turn on. 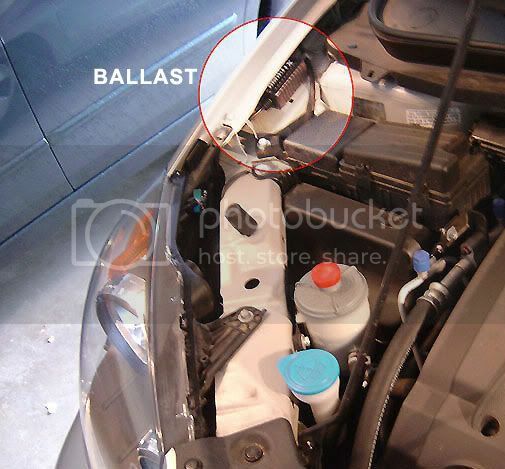 Solution: Reverse polarity of the ballast plug. This simply means flip the oval plug you inserted into the ballast. Ballasts are polarity (-/+) sensitive unlike regular halogen light bulbs. Retest. If problem still exists, swap ballasts or light bulbs to diagnose if the problem is the light bulb or the ballast. In many cases, its not the HID kit that is the culprit but the vehicle. Some vehicles such as Chrysler/Dodge/Jeep/BMW/Mercedes etc.. may require additional wiring/canceller plugs for HID installation. Lights turn on, flicker or shut off quickly thereafter. Solution: In many cases, it's not the HID kit that is the culprit but the vehicle. Some vehicles such as Chrysler/Dodge/Jeep/BMW/Mercedes etc.. may require additional wiring/canceller plugs for HID installation. Step 1: Open hood and locate the factory light bulb you are trying to convert. If fog lights, you may need to pull out your factory fog light housing to access the back. On some vehicles you can access factory bulbs from the engine bay or from the wheel wells with your wheels fully turned on direction. Please consult your owners manual or dealer on how to access your factory light bulbs. In 90% your bulbs are easily removed without too much trouble. Once your factory light bulb is removed, you can prepare for the HID bulb insertion. Step 2: Remove the plastic capsule preinstalled on the HID bulb and insert into your headlight socket. HID bulbs should fit similar to your factory light bulb, but the tolerances may be slightly different on certain vehicle models. Bulb installation will vary from twisting to clamping from the back depending on the bulb type. Be very gentle with the HID glass portion. Do not touch the glass with your fingers. If it does end up getting dirty, simply wipe with clean cloth gently. Notice: Some vehicle models may require adapters for the bulb to fit into the socket. These include H7 bulbs. Some parts off of your original headlight may be be required depending on car model. Example, 9007 light bulbs will require the reinstallation of the plastic bulb holder adapter. Some BMW/VW/Mercedes/Saab will require a metal adapter or plastic adapter to hold the bulb in place. Step 3a: Once the HID bulb is fixed into place locate the factory connector where the original halogen bulb was connected to. You will now connect the supplied wire (may be a plug or 2 metal tips) that you must insert into your factory connector as shown below. When we say factory connector, this is the connector your original bulb was feed power with. If you purchased a Bi-xenon kit, or a kit with relay, your installation will be a little different than above. See steps 3b or 3c. Step 3b: If your kit included a relay you will not use the provided extra wires shown in Step 3a. that connect ballast to factory headlight plug. Instead the ballast get connected to the relay as shown below. The relay then will connect to your factory headlight plug. Some relays will have two plugs one for each side, while others only one headlight plug. Remember a relay simply gets a signal from your headlight plug, then allows power to flow directly from your battery. Step 3c: If your kit purchased is a bi-xenon kit also known as hi/low (low beam + high beam HID with movement). This only applies to kits with bulb types 9004 9007 H4 H13 9008. Notice on these kits there will be only 1 headlight plug connector. One of your headlight connectors may not be used. Step 4: Before mounting ballast permanently please test the system. Low beam, high beam and fog light function if it applies to your install. It is best to turn the vehicle on to test the system as some vehicles do not give full voltage when vehicle is running only from battery. 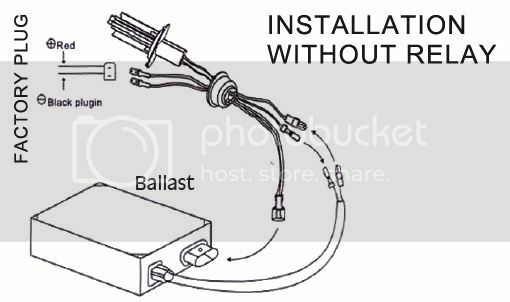 Step 5: Mount the ballasts on any existing bolt or flat surface away from excessive heat. We do not recommend mounting on top of the radiator or in front or behind it. Ballasts are electronic devices which excessive heat can ruin. Make certain the wires with your kit cannot get tangled into the belt line or are resting on very hot components of the engine.